Davy Crockett is one of the more fascinating United States historical figures. Whether he was ranching and hunting, serving as a congressman, or battling at the Alamo, Crockett did nothing in half measures. He lived his life to the fullest, always searching for the next adventure. In this biography, kids in grades 3-8 will share in the adventures of Crockett’s life. Written for reluctant readers, this series is meant to match the social studies curriculum, but at least two levels below their grade. 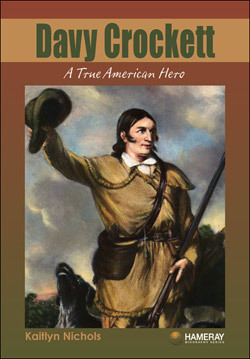 This easy to read biography of Davy Crockett would be a great addition to school libraries and classrooms studying his heroic actions.